The course of the war in the Middle East might have been dramatically changed Sunday by an Israeli airstrike on southern Lebanon that killed more than 50 civilians, many of them children. Lebanese Prime Minister Fuad Siniora said his government will call off all negotiations until a cease-fire is achieved. "What we have really been witnessing is something beyond description, and this is something that is unacceptable – that's why we are asking for an immediate and unconditional cease-fire," Siniora said on CBS's Face The Nation. "We cannot continue discussing under the sword of blood that is being put on our necks." U.N. Secretary-General Kofi Annan called an emergency meeting of the Security Council and reiterated his call for an immediate "cessation of hostilities." Annan said he is "deeply dismayed" that his previous calls have gone unheeded. He says action is needed now, before the conflict takes any more casualties. "There is no military solution. There has to be a political agreement," Annan said after the Security Council met. "A political agreement that leads to disarmament of all militias, including Hezbollah. A political agreement that allows the Lebanese government to strengthen its own army, with the support of the international community, and extend its authority throughout the territory." U.S. Secretary of State Condoleezza Rice cut short her trip to the region, returning to Washington a day early, after the Lebanese government refused a diplomatic visit. The White House offered condolences to the victims of today's attack, calling it a "terrible and tragic incident," but will not support an unconditional cease-fire. President Bush's spokesman, Tony Snow, told reporters that the administration still wants "a cease-fire that will work" – and one that is sustainable. Israeli missiles hit several buildings in a southern Lebanese village as people slept, killing at least 56, most of them children, in the deadliest attack in 19 days of fighting. The Lebanese Red Cross said the airstrike in Qana, in which at least 34 children were killed, pushed the overall Lebanese death toll to more than 500. Survivors said civilians were killed when the building they sought refuge in collapsed. A Red Cross official said 56 bodies had been found so far. The Israeli army said it did not know that there were civilians in the building at the time of the attack, reports CBS News chief foreign correspondent Lara Logan. Israel said it had warned civilians to stay away from the area. "They were not warned, and in fact, the village had more than 50 raids at that time, all night," Siniora told Bob Schieffer. "The people got shelter in that building and they were killed." The Israeli army says this particular area has been used to fire hundreds of rockets, Logan reports. Israeli officials apologized on television and at the U.N. for killing civilians, calling each death a "horrible mistake," but they blamed the bombing of Qana on Hezbollah's tactics. Olmert accused the guerrillas of wanting "to see children's blood." "They put their rockets and missiles in civilian life, so we have to go from a place to a place and destroy it," Deputy Prime Minister of Israel Shimon Peres said of Face The Nation. British Prime Minister Tony Blair said the attacks in Qana were "absolutely tragic" and that the situation "absolutely cannot continue." In response to the attack, angry protesters broke into the main U.N. building in Beirut Sunday, burning U.N. and American flags. Around 500 protesters massed outside the building, which was empty on the weekend day. Some pushed through police barricade, smashed windows and broke inside the building. Outside, demonstrators chanted slogans against Israel and the United States and denounced Arab governments for not doing enough to stop Israel's 19-day bombardment of Lebanon. Hezbollah said on its Al-Manar television that it will retaliate. "The massacre at Qana will not go unanswered," a representative said. In Jerusalem, Rice said she was "deeply saddened by the terrible loss of innocent life" in the attack and said, "We want a cease-fire as soon as possible." Two days earlier, Saniora had proposed a plan for ending the fighting that had won Hezbollah backing. Rice had said the plan had positive aspects. But an angry Saniora said after Sunday's strike that Lebanon only wanted to talk now about "an immediate, unconditional" cease-fire. President Emile Lahoud in a telephone interview with al-Jazeera TV said that U.S. support for Israel was partly to blame for what he called "Israel's massacres." Before news of the strike emerged, however, Israeli Prime Minister Ehud Olmert told Rice that Israel would likely fight on for another 10 to 14 days. Israel launched its second ground incursion into southern Lebanon. Before dawn Sunday, Israeli forces backed by heavy artillery fire crossed the border and clashed with Hezbollah guerrillas in the Taibeh Project area, about two miles inside Lebanon. Hezbollah said eight Israeli soldiers were killed, while the Israeli army said only that one of its soldiers had been moderately wounded. Hezbollah guerrillas hit an Israel tank with an anti-tank missile on Sunday, wounding four Israeli soldiers who were evacuated to Israel, the military said. Israeli missiles struck near the main Lebanese border crossing into Syria on Saturday, forcing its closure for the first time in the 18-day-old conflict, police officials said. Israeli warplanes fired three missiles that landed at the Masnaa crossing, about 300 yards beyond a Lebanese customs post, the officials said. They said the area is considered to be part of Lebanese territory. On the Lebanon-Israel border, an Israeli strike hit near a U.N. peacekeepers' station, wounding two. The world body had just relocated unarmed U.N. observers to the peacekeepers' posts for safety after four U.N. observers were killed on Tuesday. The United Nations World Food Program canceled an aid convoy's trip to the embattled south, after the Israeli military denied safe passage, the group said in a statement. The six-truck convoy had been scheduled to bring relief supplies to Marjayoun. On Saturday, Israel rejected a request by the U.N. for a three-day cease-fire in Lebanon to get in supplies and allow civilians to leave the war zone. Both President Bush and the Democrats tackled the Middle East crisis in Saturday's radio addresses. Mr. Bush saw an opportunity to bring change to the Middle East, but Gov. Bill Richardson said the U.S. needs a new approach. Mohammed Shaloub, a survivor of the Israeli airstrike, said there were 55 people in the house and eight survived. 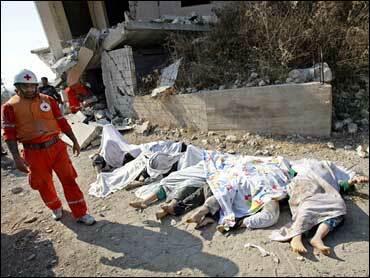 The bodies of at least 27 children were found, said Abu Shadi Jradi, a civil defense official at the scene. Corpses were still being pulled out, placed in plastic bags and loaded in ambulances, he said. An Associated Press reporter saw 20 bodies being wrapped in bedsheets, carpets and blankets, and being hauled away. The dead included children, several old men and women. Noor Hashim, a 13-year-old girl who survived the attack, estimated that 55 people were in one building, including about 30 children. Only 8 people survived in all, she said. Israel said it targeted Qana because rockets were launched at Israel from there. "The army did not get an order to strike at Lebanese civilians. In Kfar Qana, hundreds of Katyushas (rockets) are hidden," Israeli Prime Minister Ehud Olmert said during his weekly Cabinet meeting, according to a participant in the meeting. "We deeply regret the loss of any civilian life and especially when you talk about children who are innocent. This is not the code of conduct of the Israeli army," Gideon Meir, a senior Israeli Foreign Ministry official, told The Associated Press. "But one must understand, the Hezbollah is using their own civilian population as human shields." He said the army dropped leaflets several days ago telling civilians to leave Qana. Residents said they were too afraid to take the road out of Qana, which had been attacked repeatedly by rockets and bombs. Charred wreckage and smashed buildings line the road from Tyre to Qana, roughly 12 kilometers away. Lebanese Defense Minister Elias Murr disputed allegations that Hezbollah was firing missiles from Qana. "What do you expect Israel to say? Will it say that it killed 40 children and women?" he told Qatar-based al-Jazeera TV station.